IS THERE SUCH A THING AS AN EMBEDDED CURATOR? In contrast to the hyper-internationality of some curators - which has led to the label 'airport curator' - others choose to immerse themselves in a specific territory or local context, and work extensively within this framework. Does this 'embedded curating' open up possibilities that might not find a place in other models of curating, for example the sharing of knowledge and expertise, and the provision of service to others? 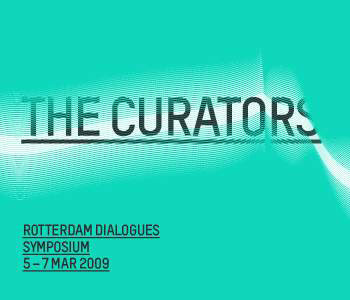 Witte de With presents a program of three symposia, titled Rotterdam Dialogues: Critics, Curators, Artists. Structured to establish a lively platform for debate and exchange, they create space for a range of voices, and explore the practice of three of the central protagonists of the contemporary art world: the critic, the curator and the artist. Critics were the subject of the first symposium, held last October. This highly successful event is now followed by The Curators on 5, 6, 7 March 2009. The series will conclude with The Artists later this year. 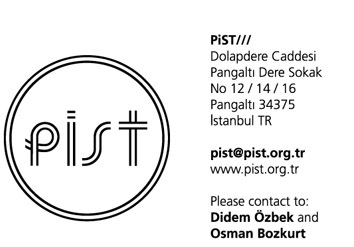 A publication will follow, bringing together elements of each symposium. Speakers The practice of curating is much discussed within the art world, but often neglected by the media and thus remains largely invisible to the broader public. With our selection of speakers, we aim to put a wide range of faces to the often elusive and contested title of "curator". The speakers are: Jamila Adeli, Anke Bangma, Bart De Baere, Carolyn Christov-Bakargiev, Pablo León de la Barra, Ute Meta Bauer, Lorenzo Benedetti, Iwona Blazwick, Nicolas Bourriaud, Sabine Breitwieser, Adam Budak, Ann Demeester, Barnaby Drabble, Mai Abu ElDahab, Zoran Erić, Bruce Ferguson, Juan Gaitan, Hou Hanru, Jan Hoet, Jens Hoffmann, Manray Hsu, Renske Janssen, Stefan Kalmár, Xenia Kalpaktsoglou, Emmanuel Lambion, Enrico Lunghi, Raimundas Malasauskas, Gerardo Mosquera, Sophie von Olfers, Paul O'Neill, Livia Páldi, Philippe Pirotte, PiST, Irit Rogoff, Beatrix Ruf, The Salford Restoration Office, Brigitte van der Sande, Kitty Scott, Seth Siegelaub, Saskia van Stein, Adam Szymczyk, Andrea Viliani, Rein Wolfs, and What, how and for whom. Topics The full program is available to download from http://www.wdw.nl. Each day has an overarching theme, subdivided into more precise questions: Thursday – Expectations, looking at the personal expectations of individual curators, of audiences and of artists, and how these expectations might influence curatorial practice. Friday – Positions, focusing on the importance of building a reputation, the power of curators to shape the canon, and the influence of the market on the profession. Saturday – Contexts, exploring the conditions and ideas underlying curating, and the increasingly international practice of exhibition making. Rotterdam Dialogues: Critics, Curators, Artists is conceived by Zoë Gray, Nicolaus Schafhausen and Ariadne Urlus.